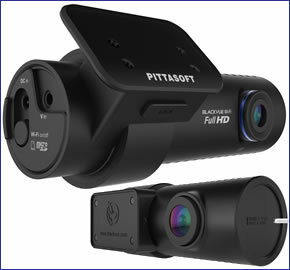 BlackVue DR650S is a leading front and rear in-car video camera for installing inside your vehicle. The BlackVue DR650S front camera records in Full HD at resolution 1920x1080 and the rear camera records in 720p. Although the Blackvue has no screen instant video playback is possible using WiFI connectivity on a smartphone. The BlackVue has a parked mode that detects motion when parked and starts recording. The system will also provide voice-guidance informing you of status of device. The BlackVue has GPS technology which will record your vehicles speed and location. Included in the box is a microSD card to record your journeys onto. The power source can be between 12V and 24V. The BlackVue DR650S is a top of the range in-car camera device with a front and rear facing camera for installing inside you car. This BlackVue is a great camera for capturing events in the road for peace of mind and for documentation for insurance purposes. The front camera records in Full HD at resolution 1920x1080 and the rear camera records in 720p. Video can be played-back instantly on a smartphone using the Blackvue DR650S's WiFi connectivity (there is no screen on the Blackvue DR650S). You can also watch Live video remotely from a mobile phone device (using the supplied BlackVue App) using the built-in Wi-Fi. The recording format is MP4, which is compatible with all computers. If you would like a larger system with an LCD touch screen whereby you can watch videos on the unit itself we recommend buying the BlackVue DR750LW-2CH instead which also includes all the features of the DR650S-2CH. If you want a Blackvue with an Infra Red rear camera for better night vision capabilities then we recommend buying the BlackVue DR650 2CH IR. The BlackVue DR650S has a super-capacitor battery for use without a charger. The in-car charger has a voltage from 12V to 24V. The included microSD card is either 32GB, 64GB or 128GB dependent upon which BlackVue DR650S model you purchase - please see 'add to cart' options above. The camera lens used is a Sony Exmor CMOS Sensor which ensures good quality recording at daytime and nighttime too. You can also connect a high quality Coaxial Cable for stable Data Transfer ensuring great playback on, for example, a television. There is also an option to send real-time videos to www.YouTube.com. A Google map are also built-in. Do you have a question about the DR650 that's not been answered on this webpage? Please see our Dash Cam FAQ's for questions from other people. If the answer to your question isn't featured, use the online form to ask us for the answer. Alternatively please telephone 01733 777623 Monday to Friday (9:30am-5:00pm) to speak to one of our sales team. For further information online please see the BlackVue dash cam comparison table. ‣Front 1080p Full HD camera and rear 720p HD camera for recording events in the road when driving and parked. Included in the box with the Blackvue DR650S is a quick release windsceen mount and 12/24v power cable. You can use the windscreen mount to locate the DR650S on the front windscreen. Many customers choose to locate the Blackvue in the centre of the windscreen near the rear-view mirror which offers a discrete installation. The rear dashboard camera connects to the front dashcam via a connection cable which is provided. Additionally, if you'd like to hardwire the BlackVue DR650S HD dash cam into your vehicles battery, you can do so by purchasing the BlackVue Power Magic Pro electric power controller (which is sold separately). The Power Magic Pro will operate in cars, vans and other commercial vehicles with a battery power supply of either 12 volts or 24 volts. In addition, once installed the hardwire power kit enables your BlackVue dashboard camera to continue to operate even when your vehicles ignition is switched off. ‣Angle of view: The front camera is 129 degrees diagonal viewing angle. The rear camera 129 degree (diagonal).